— বেন স্টিলার, দ্যা ২০০৮ টাইম ১০০, এন্ট্রি নং. ৬০, "রবার্ট ডাউনি জুনিয়র"
Stiller says that he and Downey always stayed focused on the fact that they were skewering insufferable actors, not African Americans. 'I was trying to push it as far as you can within reality,' Stiller explains. 'I had no idea how people would respond to it.' Stiller screened a rough cut of the film [in March 2008] and it scored high with African Americans. He was relieved at the reaction. 'It seems people really embrace it,' he said. ↑ ওয়েলশ ও হোয়েলী ২০১৩, পৃ. ৬৯. ↑ As listed in the credits on the CD version of The Futurist. 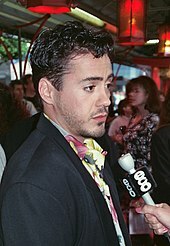 ↑ "Robert Downey Jr. Biography"। পিপল (ম্যাগাজিন)। সংগ্রহের তারিখ জুলাই ১০, ২০১৪। On September 7, 1993, the couple welcomes a son, Indio. 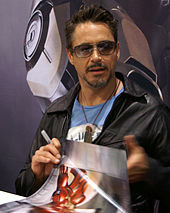 ↑ "Robert Downey Jr." episode of Biography, 2007; viewed August 29, 2008. ↑ "Downey's Wife Asks for Divorce"। ABC News। সংগ্রহের তারিখ জানুয়ারি ২৪, ২০১৬। On September 7, 1993, the couple welcomes a son, Indio. 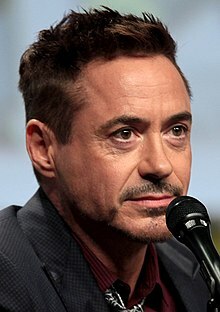 ↑ বেঞ্জামিন (১০ জানুয়ারি ২০১৪)। "Robert Downey Jr., Producer Wife Susan Reveal Their Quirky Relationship, "Perfectly Symbiotic" Marriage"। hollywoodreporter.com (ইংরেজি ভাষায়)। দ্য হলিউড রিপোর্টার। সংগ্রহের তারিখ ২৬ অক্টোবর ২০১৫। Downey and Susan quietly struck up a romance during production, though Susan turned down his romantic advances twice. ↑ ইউটিউবে The Oprah Winfrey Show, third segment, November 22, 2004. Retrieved March 23, 2009. 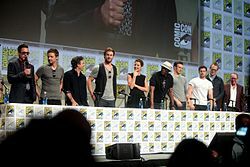 ↑ ক খ গ ইউটিউবে "Sherlock Holmes" panel (2 of 2) – Comic-Con 2009. July 24, 2009. San Diego Comic-Con International 2009.